Dragon Blade: Is John Cusack Awkward Or Believable As A Roman Soldier? Some actors can pull off any person in any time period with chameleon like precision, while others can't even pretend to be anyone but themselves. Granted, these two extremes are the most fun to watch, but the people that tend to be overlooked are those who can pull off one or two different time periods adequately, while mostly playing to their strengths throughout their career. Judging by the latest poster for Dragon Blade, it looks like John Cusack belongs to two of the three camps, but it's hard to tell which one he falls into more often than not. This debate has been sparked by Collider, who reported in with this new poster from the American Film Market. Not only is John Cusack along for the ride, but Academy Award winner Adrian Brody and famed martial arts/comedy actor Jackie Chan are also on board. Dragon Blade is listed as simply being about, "a missing legion of Roman soldiers that traveled into China in 48 B.C." So that explains the armor, the swords, and Jackie Chan... but it doesn't explain what to expect from John Cusack, or either of his co-stars, for that matter. Horrible Photoshop job aside, it's kind of weird seeing John Cusack in a Roman's armor. Playing Edgar Allen Poe in The Raven is one thing, (and frankly Cusack was pretty good playing the morose writer in a film that was more grounded than expected), but playing a Roman centurion, who will probably have to use that sword in battle... now that's something we're not completely ready to believe. At the same time, however, we're not ready to write it off. Again, the amateur job the poster has done in selling Dragon Blade has us less convinced than anything else, as John Cusack is a pretty capable actor when given the right material. While Dragon Blade screams the complete opposite vibe, you do have to keep in mind that the American Film Market event is home to a lot of posters like these. This is largely because most films marketed at AFM are still in early days of development/production, meaning that there isn't going to be a ton of official photographic material to speak of. But to answer the question, if the poster is any indication of how serious this film has taken its production process, then yes... things are going to get awkward. Like Colin Farrell in Alexander awkward. Still, John Cusack deserves better, guys. While his output as of late hasn't reached anywhere near the heights he's seen in his career, he still has some interesting projects that come out every once and a while. If you don't believe us, then take a look at his next big project, David Cronenberg's Hollywood roast Maps To The Stars, which will be released on February 27, 2015. 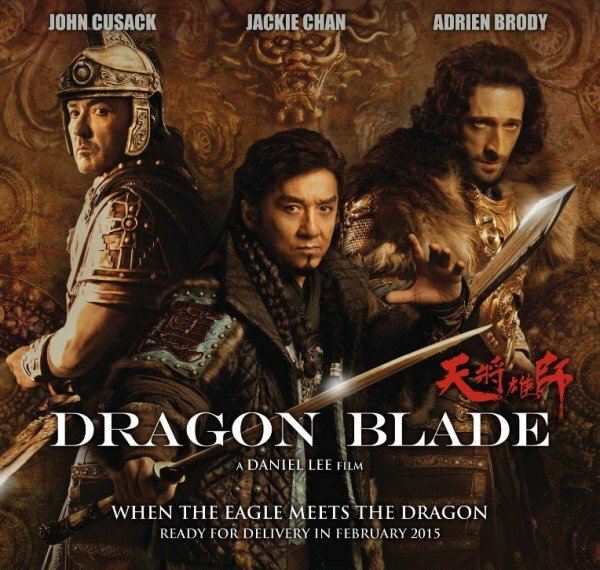 Meanwhile, The Eagle will meet The Dragon (whatever that means) when Dragon Blade is released next year.